Welcome to the CommuniGator Resource Centre for installed customers. Everything GatorMail related is for version 7.1 of the product. The copy campaign function is a useful and time-saving tool. The new campaign will be an exact copy of the one selected. This will include exact copies of the campaign details, any follow ups, surveys or merge fields and audience (if you want to send to a different audience group, make sure to clear this first). Click on the 'New Campaign' button under the campaign. This will bring up what you can see above. Once you have clicked the 'Copy' button, a pop up window will be displayed (as shown above). 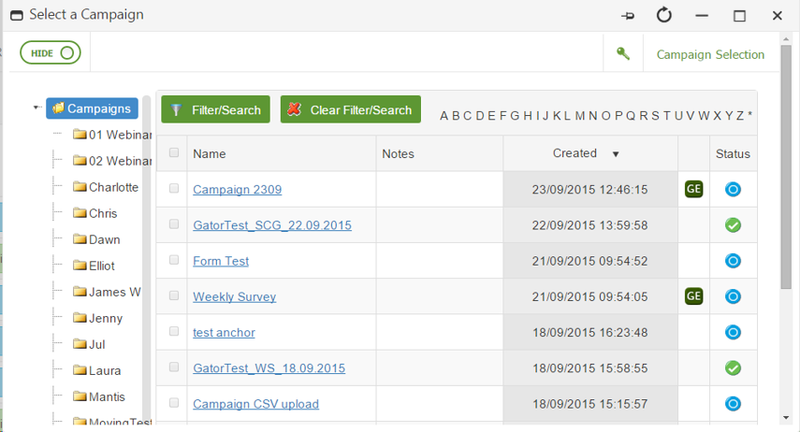 From here you can search for previous campaigns via the filter button, or by looking through your file directories on the left hand side. Once you have found and clicked on the correct campaign/email you will be returned to the previous menu. The file that you copied will be displayed under the notes header, next to the copy button you used earlier. To the left of this, choose the name of the file as you normally would when creating a campaign/email. Make sure to use clear naming conventions when creating your duplicate campaigns.